After a few attempts at creating mutual support funds and mutual credit funds in the middle of the 19th century, the success of the innovative Christian model defined by Friedrich Wilhelm Raiffeisen in the Rhine region inspired a few pragmatic utopian theorists and French clergymen wishing to help people break away from the ‘poverty, dependency, poverty’ cycle. The genuine starting point of the French mutual bank model is thus to be found in the region of Westerwald and in the relevance of the economic and social success of the first German Raiffeisen banks. This success allowed for the replication of the model in France, first in the Alsace-Moselle region (which at the time was annexed by Germany), and then throughout the rest of France, where the development of co-operative banks was much more fragmented because of the action of multiple players: farmers’ unions, agronomic societies and Government authorities. In this complex environment, Louis Durand and Ludovic de Besse supported the creation of rural lending funds and popular lending funds in France. These funds sometimes managed to join forces, but were also sometimes at odds with each other, in particular as regards issues such as religious neutrality and relationships with the State. 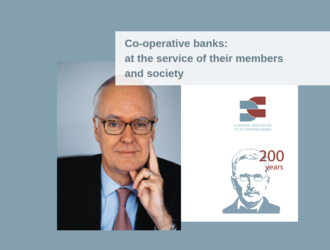 from the 1980s until the present time: the specific features and operational restrictions of co-operative banks disappeared gradually after the enactment of the 1984 Banking Act, which converted co-operative banks into universal banks, which incrementally became major national players by acquiring other banks. In an increasingly globalized environment marked by European financial and regulatory harmonisation, Crédit Mutuel is strengthening its ratios (CET1 equal to 15.7%) in order to become one of Europe’s most solvent banks. The success of Raiffeisen’s ideas throughout the 20th century is explained by the convergence of ethics and economics in corporate actions, deposits and loans, but also and most importantly by the co-operative bank’s ability to respond to people’s needs and expectations by adapting its policies. Crédit Mutuel was able to do this by developing its products and services, the banking insurance sector and additional services (electronic money, telephony, remote monitoring, etc. ), while remaining faithful to its original co-operative model and founding values. While asserting its resolve to enjoy managed growth outside its boundaries, Crédit Mutuel primarily remains a national retail bank wishing to offer high-quality service to its 7.7 million members and its 31 million clients. The Group’s deep regional roots and its participation in the financing of regional economies are reflected by the fact that more than 91% of its loans are mobilized in France, a ratio very markedly exceeding that observed with other large French banks. Our permanent objective consists in offering to our clients/members high-quality diversified services adapted to each client, while always protecting the absolute confidentiality of computerized data. Retail banking – the Group’s core business – accounts for 72% of our Net Banking Income and confirms the relevance of a development model in which co-operative proximity, technology and our ability to listen to clients play a pivotal role in the success of our bank, which does not pay any commissions on sales: the proposed advice and solutions are designed in our clients’ interest. Bolstered by its strong commitments, Crédit Mutuel has developed on-line offers, but also aims at assisting clients who are financially weakened. Also, we have supported social micro-credit initiatives. Thanks to their involvement and expertise, all of our 82,000 employees and 24,000 elected officials strengthen our Group’s financial solidity, by making it secure and lasting, by actively contributing to the increase in the proportion of French households with a bank account, while increasing democratic governance modes throughout the country. The Group’s results have been hailed as highly remarkable, and for more than 10 years Crédit Mutuel has become the favourite brand of the French people, thus bearing testimony to the strong trust relationship existing between Crédit Mutuel and its clients/members. Crédit Mutuel’s 2,107 local banks, 18 regional federations and 6 federal or inter-federal banks hold their general meeting each year. Such meetings thus enable nearly 500,000 members of Crédit Mutuel to elect 24,000 volunteer officials representing our 7.7 million clients/members. During such democratic gatherings, and in particular during the renewal of the local or regional boards, Crédit Mutuel fosters diversified and balanced representation by our elected officials. Regional federations also encourage a more active representation of women and prompt the youngest citizens to become involved in the life of their local bank. Elected officials are made aware of generational changes (age limit, limitation of the joint holding of corporate offices). The efforts made in order to appoint a larger number of women as elected officials are bearing fruit. Indeed, during the latest board renewal, gender equality was nearly achieved during the elections made at general meetings. Numerous training programs are offered to the 24,000 volunteer officials so that they may fully fulfil their duties. Within the Group as a whole, the training of volunteer officials represents more than 120,000 hours per year, and each official assumes the moral obligation to participate in one training program per year. Also, a genuine reflection focused on the concept of Mutual and Social Responsibility (MSR) was initiated in numerous regional federations and now makes it possible for each local bank to prepare a mutual action plan.